Creator. Comforter. Healer. Friend. 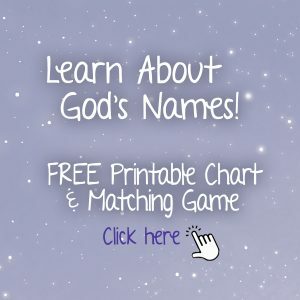 God’s names tell us who He is, what He is like, and what He does. 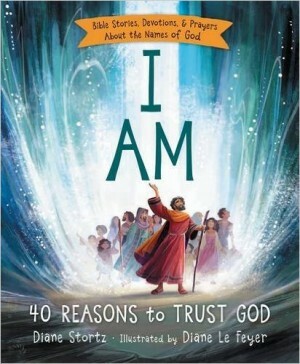 This beautiful book covers forty of the Bible’s many names and descriptive titles for God, Jesus, and the Holy Spirit, including Jehovah Jireh, The Lord My Shepherd, Immanuel, Rabbi, and I Am. Click here to download free coloring sheets from I Am. Curl up together and experience the Bible in a fresh, new way. Babies, toddlers, and young preschoolers will enjoy pointing to and naming objects on each page for early learning. Most important, they’ll discover favorite, age-appropriate Bible stories, with Scripture verses and short prayers that also hide God’s Word in young hearts. 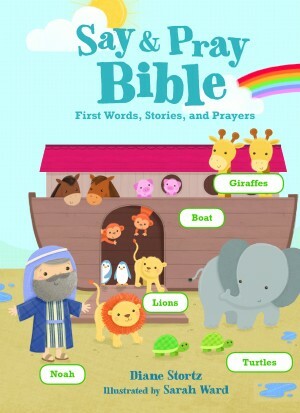 This durable, padded-cover board book includes 20 stories, 10 from the Old Testament and 10 from the New Testament. The stories are short—just one or two sentences—perfect for the age group! 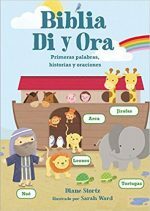 After hearing a story and pointing to objects in the illustration, little ones can “say and pray” the related Bible verse and prayer with each story too. Makes a perfect baby gift or birthday gift—a book to grow on! 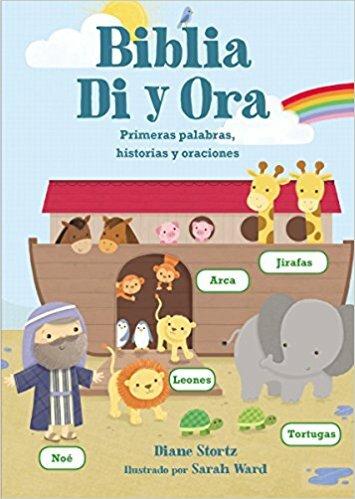 Now available in Spanish too! What better way to spend the last few minutes of the day than snuggled up with your children, pouring God’s love into their hearts? God’s Words to Dream On calms, quiets, and opens hearts to hear faith-building Bible stories and prayers. Over 50 stories—from the Old and New Testaments—create an overview of the Bible with a focus on God’s love, care, protection, trustworthiness, and power. 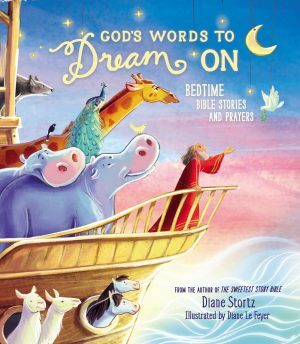 Each night you’ll enjoy a Bible story, a Bedtime Blessing based on the story, a Bible verse (God’s Words to Dream On), and a Sleepy-Time Prayer. This new version of the original Words to Dream On features a redesigned, glittery cover and an easier-to-read typeface inside. Click here to download free coloring sheets from Words To Dream On. Sweet things surround a little girl’s life: hearts and flowers, kittens and puppies, umbrellas and tea parties, kisses and hugs. But the sweetest thing of all is God’s love. 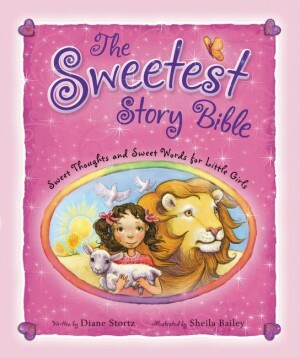 The Sweetest Story Bible includes 40 carefully selected Bible stories from Genesis to Revelation that show your little girl how much God loves His people—and her! 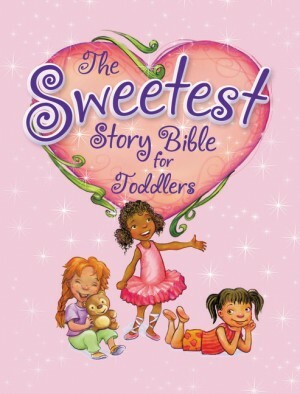 A Sweet Thought sums up each story, and Sweet Words—short Bible verses—connect your little girl’s life even more to God’s wonderful Word. More than 200,000 copies in all editions have been sold. Roma Downey (Touched by an Angel and The Bible Series) reads all 40 stories on two CDs. The book and CDs come in a convenient slipcase. Features Spanish and English stories side by side. Little girls want to be just like their big sisters! 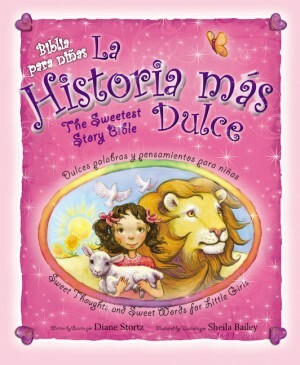 The Sweetest Story Bible for Toddlers features 8 stories retold for toddlers from The Sweetest Story Bible. Short stories, large pictures, board pages, and a padded cover that sparkles make this book ideal for the youngest little girls in your life.